Now published! L.M. Montgomery – Joyce's mystery and fiction book reviews with some non-fiction too! Every month I impatiently wait for news of new books in this series. This time I was delighted to see L.M. Montgomery as a subject. If anyone out there does not know, L.M. 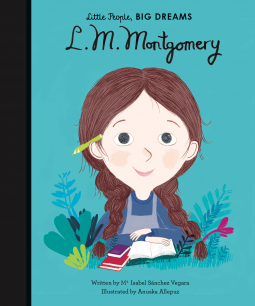 Montgomery wrote one of the (and my) most beloved childhood books, Anne of Green Gables. That story about an impulsive, loving young girl who brought new life to brother and sister, Matthew and Marilla, is full of the wonders of friendship, nature and life’s daily challenges. How did Miss Montgomery create the novel? This book explains that young Maud wrote a story of the childhood that she wished she had experienced. In doing so, she brought joy to countless children and the adults who read to them. In this entry in the Little People, Big Dreams series, young readers will get to know Maud, understand her early years and see the spirit that moved her toward her dream of becoming a published author. Read this book to a child you know and then, read or re-read the books that made Maud Montgomery a beloved resident of Prince Edward Island. Thanks to NetGalley, the publisher and the author.